While the vision of fully automated road traffic implies the total disappearance of traffic jams, the implications of mixed traffic on the traffic flow are still unclear. Currently, the presented automated vehicles react defensively to human misbehaviour. Therefore, a significant reduction of the traffic flow is anticipated for the hybrid traffic - while the overall traffic congestion is expected to grow through empty runnings, especially for the commercial transport. In the following, the term automated vehicle describes a vehicle that drives without a human driver but still needs a fixed start- and endpoint as well as a route definition. This means that the car is able to change lanes to overtake, but it does not take turns on its own accord for a more efficient route. Based on the results of the second phase, the traffic flow will be predicted and optimised in different environments (e.g., highway, inner city) with increasing grades of automation by cooperation of traffic modeling, data analysis, and communication. The overall aim is to minimise the total dwell time of all vehicles inside the traffic network. For this purpose, the microscopic traffic simulation models will be extended by communicating automated vehicles in order to allow the simulation of different realizations of the behaviour of these vehicles and to elaborate the potentials for further optimisation. The traffic prediction is then performed based on these models. 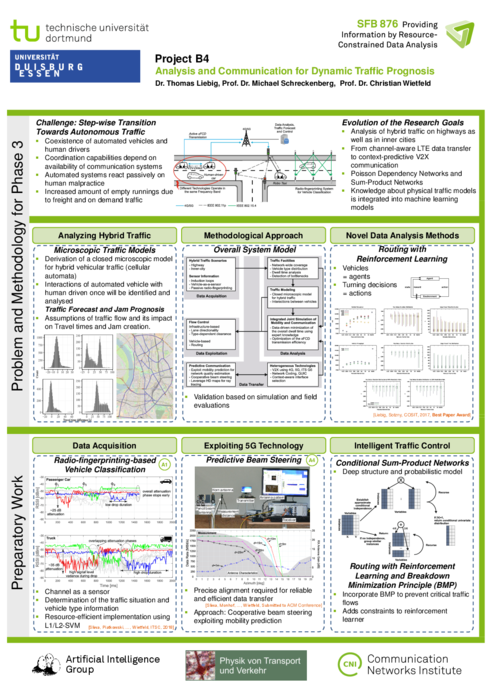 In so-called closed-loop-scenarios, strategies for traffic control will be developed with deep reinforcement learning methods that also consider human drivers, which only follow the developed model sporadically. The central as well as the local exchange of the required data will follow the privacy-by-design paradigm in order to protect the distribution of sensitive mobility patterns, for example, through application of homeomorphic encryption. For the provision of Ultra-reliable Low Latency Communication (URLLC) in a Vehicle-to-Everything (V2X) context, available knowledge about the mobility behaviour of vehicles and information about the topology of the surrounding environment will be leveraged for predictive routing, handover, and resource allocation as well as dynamic antenna steering in order to optimise decision processes within 5G networks. The respective methods will furthermore be integrated into the predictive Channel-aware Transmission (pCAT) scheme that was developed in the second phase and evaluated in field tests. Sliwa/etal/2019a Benjamin Sliwa and Stefan Falten and Christian Wietfeld. Performance evaluation and optimization of B.A.T.M.A.N. V routing for aerial and ground-based mobile ad-hoc networks. In 2019 IEEE 89th Vehicular Technology Conference (VTC-Spring), Kuala Lumpur, Malaysia, 2019. Becker/Schreckenberg/2018a Becker, Merlin and Schreckenberg, Michael. Effiziente rechnergestützte Berechnung und Visualisierung von Mindestzugfolgezeiten. In Eisenbahntechnische Rundschau, Vol. 1+2, No. 67, pages 30--34, 2018. Eckermann/etal/2018a Fabian Eckermann and Philipp Gorczak and Christian Wietfeld. tinyLTE: Lightweight, ad hoc deployable cellular network for vehicular communication. In IEEE Vehicular Technology Conference (VTC-Spring), 2018. Monhof/etal/2018a Stefan Monhof and Marcus Haferkamp and Benjamin Sliwa and Christian Wietfeld. Payload-size and deadline-aware scheduling for upcoming 5G networks: Experimental validation in high-load scenarios. In 2018 IEEE 88th IEEE Vehicular Technology Conference (VTC-Fall), Chicago, USA, 2018. Pillmann/etal/2018a Johannes Pillmann and Benjamin Sliwa and Christian Wietfeld. The autoMat CVIM - A scalable data model for automotive big data marketplaces. In 19th IEEE International Conference on Mobile Data Management (MDM), Aalborg, Denmark, 2018. Pillmann/etal/2018b Johannes Pillmann and Daniel Behnke and Benjamin Sliwa and Matthias Priebe and Christian Wietfeld. Efficient and reliable car-to-cloud data transfer empowered by BBR-enabled network coding. In 2018 IEEE 88th IEEE Vehicular Technology Conference (VTC-Fall), Chicago, USA, 2018. Sliwa/etal/2018b Benjamin Sliwa and Marcus Haferkamp and Manar Al-Askary and Christian Wietfeld. A radio-fingerprinting-based vehicle classification system for intelligent traffic control in smart cities. In 2018 Annual IEEE International Systems Conference (SysCon), Vancouver, Canada, IEEE, 2018. Sliwa/etal/2018f Benjamin Sliwa and Johannes Pillmann and Maximilian Klaß and Christian Wietfeld. Exploiting map topology knowledge for context-predictive multi-interface car-to-cloud communication. In 2018 IEEE 88th IEEE Vehicular Technology Conference (VTC-Fall), Chicago, USA, 2018. Vranken/etal/2018a Tim Vranken and Benjamin Sliwa and Christian Wietfeld and Michael Schreckenberg. Performance comparison of dynamic vehicle routing methods for minimizing the global dwell time in upcoming smart cities. In 2018 IEEE 88th IEEE Vehicular Technology Conference (VTC-Fall), Chicago, USA, 2018. Becker/etal/2017a Becker, Merlin and Habel, Lars and Schreckenberg, Michael. Analytical Method for the Precise and Fast Prediction of Railway Running Times. In IEEE 5th Conference on Models and Technologies for Intelligent Transportation Systems (MT-ITS), IEEE, Naples, Italy, 2017. Bette/etal/2017a Bette, Henrik M. and Habel, Lars and Emig, Thorsten and Schreckenberg, Michael. Mechanisms of jamming in the Nagel-Schreckenberg model for traffic flow. In Physical Review E, Vol. 95, No. 012311, 2017. Haferkamp/etal/2017a Marcus Haferkamp and Benjamin Sliwa and Christoph Ide and Christian Wietfeld. Payload-Size and Deadline-Aware Scheduling for Time-critical Cyber Physical Systems. In Wireless Days 2017, Porto, Portugal, 2017. Haferkamp/etal/2017c Marcus Haferkamp and Manar Al-Askary and Dennis Dorn and Benjamin Sliwa and Lars Habel and Michael Schreckenberg and Christian Wietfeld. Radio-based Traffic Flow Detection and Vehicle Classification for Future Smart Cities. In IEEE Vehicular Technology Conference (VTC-Spring) Workshop on Connecting All Things for Enabling Smart Cities (CONTEST), Sydney, 2017. Krause/etal/2017a Krause, Sebastian M. and Habel, Lars and Guhr, Thomas and Schreckenberg, Michael. The importance of antipersistence for traffic jams. In Europhysics Letters (EPL), Vol. 118, No. 38005, 2017. Mladenov/etal/2017b Mladenov, Martin and Belle, Vaishak and Kersting, Kristian. The Symbolic Interior Point Method. In Satinder Singh and Shaul Markovitch (editors), Proceedings of the 31st AAAI Conference on Artificial Intelligence (AAAI), AAAI Press, 2017. Pillmann/etal/2017a Johannes Pillmann and Benjamin Sliwa and Jens Schmutzler and Christoph Ide and Christian Wietfeld. Car-To-Cloud Communication Traffic Analysis Based on the Common Vehicle Information Model. In IEEE Vehicular Technology Conference (VTC-Spring), 2017. Pillmann/etal/2017b Johannes Pillmann and Benjamin Sliwa and Christian Kastin and Christian Wietfeld. Empirical evaluation of predictive channel-aware transmission for resource efficient car-to-cloud communication. In IEEE Vehicular Networking Conference (VNC), Torino, Italy, 2017. Pillmann/etal/2017c Johannes Pillmann and Christian Wietfeld and Adrian Zarcula and Thomas Raugust and Daniel Calvo Alonso. Novel Common Vehicle Information Model (CVIM) for Future Automotive Vehicle Big Data Marketplaces. In IEEE Intelligent Vehicles Symposium., 2017. Sliwa/etal/2017a Benjamin Sliwa and Robert Falkenberg and Christian Wietfeld. A Simple Scheme for Distributed Passive Load Balancing in Mobile Ad-hoc Networks. In IEEE Vehicular Technology Conference (VTC-Spring), Sydney, 2017. Sliwa/etal/2017b Benjamin Sliwa and Johannes Pillmann and Fabian Eckermann and Christian Wietfeld. LIMoSim: A lightweight and integrated approach for simulating vehicular mobility with OMNeT++. In OMNeT++ Community Summit 2017, Bremen, Germany, 2017. Sliwa/etal/2017c Sliwa, Benjamin and Pillmann, Johannes and Eckermann, Fabian and Habel, Lars and Schreckenberg, Michael and Wietfeld, Christian. Lightweight joint simulation of vehicular mobility and communication with LIMoSim. In IEEE Vehicular Networking Conference (VNC), Torino, Italy, 2017. Habel/etal/2015a Habel, Lars and Molina, Alejandro and Zaksek, Thomas and Kersting, Kristian and Schreckenberg, Michael. Traffic simulations with empirical data -- How to replace missing traffic flows?. In Knoop, Victor L. and Daamen, Winnie (editors), Traffic and Granular Flow '15, pages 491-498, Springer, 2016. Habel/etal/2016a Habel, Lars and Ide, Christoph and Wietfeld, Christian and Schreckenberg, Michael. Improving Vehicular Traffic Simulations Using Real-Time Information on Environmental Conditions. In IEEE Vehicular Technology Conference (VTC Fall), IEEE, Montreal, Canada, IEEE, 2016. Habel/Schreckenberg/2016a Habel, Lars and Schreckenberg, Michael. Analysis of Asymmetric Lane Changing in a CA-Based Highway Traffic Model. In Journal of Cellular Automata, Vol. 11, No. 4, pages 351-361, 2016. Niehoefer/etal/2016a Niehöfer, Brian and Schweikowski, Florian and Wietfeld, Christian. LOcal interferenCe compensATion (LOCATe) for GNSS-based Lane-Specific Positioning of Vehicles. In IEEE Vehicular Technology Conference (VTC-Spring), IEEE, Nanjing, China, 2016. Sliwa/etal/2016a Benjamin Sliwa and Christoph Ide and Christian Wietfeld. An OMNeT++ based Framework for Mobility-aware Routing in Mobile Robotic Networks. In OMNeT++ Community Summit 2016, 2016. Sliwa/etal/2016b Sliwa, Benjamin and Behnke, Daniel and Ide, Christoph and Wietfeld, Christian. B.A.T.Mobile: Leveraging mobility control knowledge for efficient routing in mobile robotic networks. In IEEE GLOBECOM 2016 Workshop on Wireless Networking, Control and Positioning of Unmanned Autonomous Vehicles (Wi-UAV), Washington D.C., USA, IEEE, 2016. Yang/etal/2016a Yang, Shuo and Khot, Tushar and Kersting, Kristian and Natarajan, Sriraam. Learning Continuous-Time Bayesian Networks in Relational Domains: A Non-Parametric Approach. In Proceedings of the 30th AAAI Conference on Artificial Intelligence (AAAI), AAAI Press, 2016. Zaksek/Schreckenberg/2016a Zaksek, Thomas and Schreckenberg, Michael. Fractal Analysis Of Empirical And Simulated Traffic Time Series. In Knoop, Victor L. and Daamen, Winnie (editors), Traffic and Granular Flow '15, Springer, 2016. Ide/etal/2015b Ide, Christoph and Nick, Michael and Kaulbars, Dennis and Wietfeld, Christian. 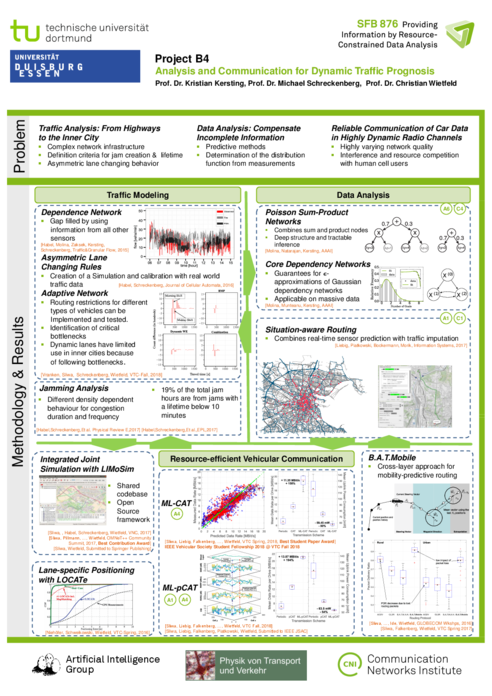 Forecasting Cellular Connectivity for Cyber-Physical Systems: A Machine Learning Approach. In Conference on Machine Learning for Cyber Physical Systems and Industry 4.0 (ML4CPS), Lemgo, Germany, 2015. Ide/etal/2015c Ide, Christoph and Dusza, Bjoern and Wietfeld, Christian. Client-based control of the interdependence between LTE MTC and human data traffic in vehicular environments. In IEEE Transactions on Vehicular Technology, Vol. 64, No. 5, pages 1856-1871, IEEE, 2015. Habel/Schreckenberg/2014a Habel, Lars and Schreckenberg, Michael. Asymmetric Lane Change Rules for a Microscopic Highway Traffic Model. In Proc. of 11th International Conference on Cellular Automata for Research and Industry (ACRI), Vol. 8751, pages 620--629, Krakow, Poland, Springer, 2014. Haegerling/etal/2014a Hägerling, Christian and Ide, Christoph and Wietfeld, Christian. Coverage and Capacity Analysis of Wireless M2M Technologies for Smart Distribution Grid Services. In accpeted for publication at IEEE SmartGridComm, Venice, Italy, 2014. Ide/etal/2014a Ide, Christoph and Habel, Lars and Knaup, Timo and Schreckenberg, Michael and Wietfeld, Christian. Interaction between Machine-Type Communication and H2H LTE Traffic in Vehicular Environments. In Proc. of IEEE 79th Vehicular Technology Conference (VTC-Spring), Seoul, Korea, 2014. Ide/etal/2014b Ide, Christoph and Piontek, Kai and Wietfeld, Christian. Identifying LTE Connectivity Hot Spots in Vehicular Environments: A Learning Approach. In GI/ITG KuVs Fachgespräch Inter-Vehicle Communication, Luxembourg City, Luxembourg, 2014. Liou/etal/2014a Liou, Ren-Huang and Lin, Yi-Bing and Sung, Yingrong Coral and Liu, Pang-Cheng and Wietfeld, Christian. Performance of CS Fallback for Long Term Evolution Mobile Network. In accepted for IEEE Transactions on Vehicular Technology, 2014. Liou/etal/2014b Liou, Ren-Huang and Ide, Christoph and Dusza, Bjoern and Wietfeld, Christian. QoE-Aware LTE Radio Link Control Parameters for Voice over IP in Vehicular Environments. In IEEE 79th Vehicular Technology Conference (VTC-Spring), Seoul, Korea, 2014. Niehoefer/etal/2014a Niehoefer, Brian and Schweikowski, Florian and Lehnhausen, Sarah and Wietfeld, Christian. Cloud-aided SDR Solution for Lane-Specific Vehicle Positioning via Local Interference Compensation. In Proc. of IEEE Aerospace Conference (AEROSPACE), Big Sky, USA, 2014. Rohde/etal/2014a Rohde, Sebastian and Ide, Christoph and Kolanczyk, Tim and Wietfeld, Christian. Local Overload Compensation through LTE System Level Interference Control in Realistic Scenarios. In IEEE 79th Vehicular Technology Conference (VTC-Spring), Seoul, Korea, 2014. Ide/etal/2013a Ide, Christoph and Kurtz, Fabian and Wietfeld, Christian. Cluster-Based Vehicular Data Collection for Efficient LTE Machine-Type Communication. In IEEE 78th Vehicular Technology Conference (VTC-Fall), Las Vegas, USA, IEEE, 2013. Ide/etal/2013b Ide, Christoph and Dusza, Bjoern and Wietfeld, Christian. Performance of Channel-Aware M2M Communications based on LTE Network Measurements. In 24th IEEE International Symposium on Personal, Indoor and Mobile Radio Communications (PIMRC), London, UK, 2013. Niehoefer/etal/2013a Niehoefer, Brian and Subik, Sebastian and Wietfeld, Christian. The CNI Open Source Satellite Simulator based on OMNeT++. In 6th OMNeT++ Workshop, Cannes, France, 2013. Niehoefer/etal/2013b Niehoefer, Brian and Schweikowski, Florian and Wietfeld, Christian. Smart Constellation Selection for Precise Vehicle Positioning in Urban Canyons using a Software-Defined Receiver Solution. In 20th Symposium on Communications and Vehicular Technology, Namur, Belgium, 2013. Ide/etal/2012d Ide, Christoph and Knaup, Timo and Niehoefer, Brian and Weber, Daniel and Habel, Lars and Schreckenberg, Michael and Wietfeld, Christian. Efficient Floating Car Data Transmission via LTE for Travel Time Estimation of Vehicles. In Proc. of IEEE 76th Vehicular Technology Conference (VTC-Fall), pages 1-5, Québec City, Canada, IEEE, 2012. Niehoefer/etal/2012a Niehoefer, Brian and Lehnhausen, Sarah and Wietfeld, Christian. Optimizing-Strategies for a Time-Efficient Evaluation of Position-Specific Communication Aspects in Disaster Relief Scenarios. In Proc. of IEEE 1st AESS European Conference on European Satellite Telecommunications (ESTEL), pages 1-6, Rome, Italy, IEEE, 2012. Niehoefer/etal/2012b Niehoefer, Brian and Lehnhausen, Sarah and Wietfeld, Christian. Combined Analysis of Local Ionospheric and Multipath Effects for Lane-Specific Positioning of Vehicles within Traffic Streams. In Proc. of 6th ESA Workshop on Satellite Navigation Technologies (NaviTech), Noordwijk, The Netherlands, 2012. Ide/etal/2011a Ide, Christoph and Dusza, Bjoern and Wietfeld, Christian. Mobile WiMAX Performance Measurements with Focus on Different QoS Targets. In LANMAN, IEEE, 2011. Maschek/etal/2011a Maschek,Thomas and Konrad, Benedikt and Deuse, Jochen and Hermanns, Gerhard and Weber, Daniel and Schreckenberg, Michael. Verkehrsforschung in der Produktionsflussanalyse - Übertragung von Modellen der statistischen Physik auf die Analyse von Produktionssystemen. In ZWF - Zeitung für wirtschaftlichen Fabrikbetrieb, Vol. 106, No. 11, pages 833--837, 2011. Niehoefer/etal/2011a Niehoefer, Brian and Lewandowski, Andreas and Wietfeld, Christian. Evaluation of the Localization Accuracy of Satellite Systems for Traffic Flow Predictions. In ION GNSS 2011, 2011. Habel/etal/2015a - Traffic simulations with empirical data -- How to replace missing traffic flows? Niehoefer/2016a Brian Niehöfer. Modellbasierte Interferenzkompensation für die satellitengestützte Ortung in urbanen Szenarien. TU Dortmund, 2016. Ide/2015a Ide, Christoph. Resource-Efficient LTE Machine-Type Communication in Vehicular Environments. 2015. Nick/2015a Nick, Michael. Entwicklung, Implementierung und Validierung von Verfahren zur Vorhersage der Konnektivität von Mobilfunksystemen. TU Dortmund, 2015. Schellhase/2015a Schellhase, Sebastian. Analyse und Optimierung der Energieeffizienz von LTE unter Berücksichtigung der Kanalqualität. TU Dortmund, 2015. Kolanczyk/2013a Kolanczyk, Tim. Bewertung von heterogenen LTE Zellularfunknetzen unter Verwendung realitätsnaher Szenarien. 2013. Kurtz/2013a Kurtz, Fabian. Entwurf und simulatorische Leistungsbewertung von Verfahren zur Bildung von Koalitionen für die effiziente Übertragung von FCD über LTE. 2013. Lehnhausen/2013a Lehnhausen, Sarah. Simulationsgestütze Berechnung von ortsspezifischen GPS Differenzdaten zur spurgenauen Lokalisierung. 2013. Schweikowski/2013a Schweikowski, Florian. Entwicklung und Bewertung eines Advanced Software Defined GNSS Receivers. 2013. Oehmann/2012a Öhmann, David. Kooperatives Verbindungsmanagement von heterogenen Funkzugangssystemen im Automobilumfeld. 2012. Schellhase/2012a Schellhase, Sebastian. Analyse von Car-2-Car Datenaufkommmen zur Optimierung der Weitverkehrsanbindung durch verschiedene Strategien der Koalitionsbildung. 2012. Lewandowski/etal/2010a Lewandowski, A. and Niehöfer, B. and Wietfeld, C.. Galileo Search-and-Rescue: Performance Aspects and new Service Capabilities. In International Journal on Satellite Communication and Networking, Special Issue: Emergency and Disaster Communication Systems Via Satellite, Wiley, 2010. Lewandowski/Wietfeld/2010a Lewandowski , A. and Wietfeld , C.. A comprehensive Approach for optimizing ToA- Localization in harsh	Industrial Environments. In IEEE Position, Location and Navigation Symposium (PLANS), Indian	Wells, CA, Vol. 1, pages 1-10, IEEE, 2010. Niehoefer/etal/2009a B. Niehöfer and R. Burda and C. Wietfeld and F. Bauer and O. Lüert. GPS Community Map Generation for Enhanced Routing Methods based on Trace-Collection by Mobile Phones. In 1st International Conference on Advances in Satellite and Space Communications (SPACOMM), Colmar (ausgezeichnet mit einem Best Paper Award), pages 156 - 161, 2009. Lewandowski/etal/2008a Lewandowski, A. and Burda, R. and Subik, S. and Wietfeld, C.. A Multiscale Simulation Environment for Performance Evaluation of high reliable heterogeneous Communication Networks. In European Simulation and Modelling Conference (ESM), Le Havre, France, 2008. Yousaf/etal/2008c Yousaf , F. Zarrar and Bauer , C. and Wietfeld , C.. An Accurate and Extensible Mobile IPv6 (xMIPV6) Simulation Model	for OMNeT++. In 1st International Conference on Simulation Tools and Techniques for	Communications, Networks and Systems (SIMUTools), Marseille, France, pages 1-8, ACM/ICST, 2008. Selten/etal/2007a R. Selten and T. Chmura and T. Pitz and S. Kube and M. Schreckenberg. Commuters Route Choice Behaviour. In Games and Economic Behavior, Vol. 58, No. 2, pages 394 - 406, 2007. Weber/etal/2006a D. Weber and R. Chrobok and S. Hafstein and F. Mazur and A. Pottmeier	and M. Schreckenberg. OLSIM: Inter-Urban Traffic Information. In T. Böhme and V.M. Larios Rosillo and H. Unger and H. Unger (editors), Innovative Internet Community Systems, pages 296-306, Springer, 2006. Chrobok/2005a Chrobok, R.. Theory and Application of Advanced Traffic Forecast Methods. Dissertation, Universit\"at Duisburg-Essen, 2005. Hafstein/etal/2004a S. F. Hafstein and R. Chrobok and A. Pottmeier and M. Schreckenberg	and F. Mazur. A High-Resolution Cellular Automata Traffic Simulation Model with	Application in a Freeway Traffic Information System. In Computer-Aided Civil and Infrastructure Engineering, Vol. 19, No. 5, pages 338-350, 2004. Selten/etal/2004a R. Selten and M. Schreckenberg and T. Chmura and T. Pitz and S. Kube	and S.F. Hafstein and R. Chrobok, A. Pottmeier and J. Wahle. Experimental Investigation of Day-to-Day Route-Choice Behavior and	Network Simulations of Autobahn Traffic in North Rhine-Westphalia. In R. Selten and M. Schreckenberg (editors), Human Behaviour and Traffic Networks, pages 1-21, Springer, 2004.